Just back from a week of sunshine and total chill out in Crete. You know it’s a good holiday when you are discussing your return visit before you’ve even left! Food wise (I shan’t bore you with the ancient Minoan blah, blah, blah…) I can honestly say I didn’t have a bum meal the whole time we were there. We self catered, so breakfast would be fruit and Greek yoghurt or ‘village bread’ and cheese. In the evening, we headed into the village of Koutaloufari and try out all of the different tavernas. Starters were always a treat – from the well know cheese and spinach pies to local speciality of rabbit in wine and thyme. Baked feta was a star find. Many of the tavernas were offering snails as a local special but I just couldn’t bring myself to give them a go. Oh and the tzatziki tastes so much better than any I have had over here- homemade or shop bought! We ate a lot of meat, and in particular I ate a lot of pork. On my first night I had Cretan pork – cooked in a clay pig in cream and herbs. The next night was giros and the following was slow cooked in a massive wood oven with herbs and honey. I fell a little bit in love with giros – marinated pork cooked on a spit and served in pitta with tzatziki. The first I had was good pork but exceptional pitta – it had sea salt and herbs and was another level of pitta bread. The second had pork which had been marinated in herbs and beer. Oh. My. Goodness. The pork was juicy and because I was the first to have it I got all of the crunchy, caramelised bits as well: result! We had some amazing lamb slow cooked in rose wine and bay leaves and hubby had sea bream a couple of times – bit, meaty things fresh from the sea in nearby Hersonissos. I had read that Cretan wine was rough and ready, but the dry whites that we had were actually very quaffable. I also got a bit of a taste for raki – a strong spirit brought at the end of a meal. Made with the grape-waste from wine making, each restaurant distils its own so they are all slightly different, and the owner will often have a shot with you as a sign of friendship. Yamas (cheers)! As an ex-tequilla drinker I didn’t find it too bad, I wonder how those owners who had a drink with each table were still standing at the end of the night! We were even given some in a shop at about 11am when we were buying honey, oil and herbs! Husband also discovered a beer call Septum. From a microbrewery on the Greek mainland is was a rich honey beer and he’s a bit gutted we can’t seem to order it over here. If anyone knows where I can get a case I would be very grateful! I really enjoy Greek food and this trip has encouraged me to try some dishes and techniques at home. Embrace the herbs – oregano isn’t something I normally use but that and thyme were used in abundance on meats, fish and cheese so I will try and get more herby. Baked feta – so simple. A dish of feta with a few tomatoes and onions, sprinkled with herbs (see above!) and olive oil and baked until gooey. I’ll be serving it with loads of pitta bread to spoon it over. Lamb in rose wine – the next time I buy lamb I’ll be slow cooking it in rose wine and bay leaves…and more herbs! Spinach and cheese parcels – a favourite of my hubby, I have always done these with just feta. However the best ones we had also had ricotta which made them even more delicious as there was more cheese than spinach. 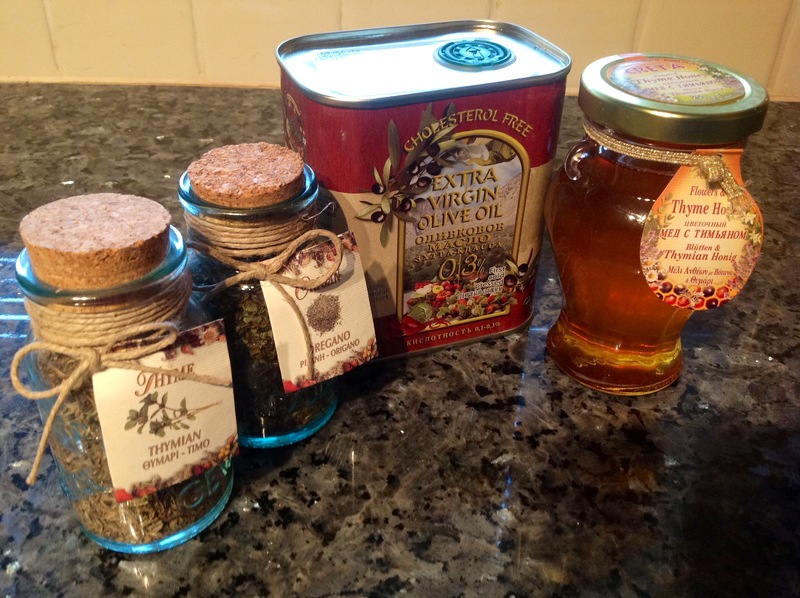 I stocked up on olive oil, thyme honey and them there herbs, so I can leave the chill and often damp reality and whisk myself off to warm, summery places during meal times at least! Yes! The one with the big wood oven outside and loads of cats. Had the amazing lamb there. Great village!